Bridgette Mayer Gallery celebrated its 13th year this June with a colorful group show that included some of contemporary art’s biggest up-and-coming artists–Arden Bendler Browning, Clara Fialho,Federico Herrero, Nathan Pankratz, Rebecca Rutstein, Graeme Todd, and Laura Watt. These names are locally renowned in Philadelphia, and in some cases, internationally. But that is to be expected from Mayer’s gallery–the group of artists she displays have, in many cases, been with the gallery since its opening in 2001. The artists who are lucky enough to be shown in this space have grown and morphed in their fame, like the gallery itself. Clara Fialho cannot be missed in this show. Her immense painting, “Placebo to Believe in Forever,” can be seen glowing through Mayer’s windows from a block away. Spanning nearly 14 feet, the diptych is a faint, feminine reminder of recently passed Chinese artist Zao Wou Ki¬–billowing clouds of cream and dreamy blues and pinks shimmer across what the viewer forgets is a canvas. The dreamlike, sky-like, and romantic landscape becomes reminiscent of a late summer evening right after the sun has dipped beneath the horizon and the sky, and all of the clouds in it become a palette of pastels. It becomes so overwhelming that you, the viewer, may just run into the wall behind you while you’re trying to step back from it and take it all in. Walking further back into the space, the viewer quickly becomes engulfed in Arden Bendler Browning’s painting, titled “Interim”. The wood-panel work creates a bold architectural landscape. Fast-paced jumbles of carefully matched, colored chaos permeate the focal point of both pieces of the diptych; resting areas of calm create a border around the pandemonium. It’s easy to get sucked into one of Browning’s paintings, and looking further into the work, it slowly but surely becomes evocative of Hockney’s pools–abstracted, of course. Walking around the wall into the back of the gallery is bound to make anybody smile. Federico Herrero greets the viewer with a work that takes over the entire back wall of the space, creating a tunnel into what feels like a landscape straight out of a Super Mario Bros. video game. The painting holds every color in the rainbow, in hues and shades that don’t overwhelm, but delight the eyes. And speaking of color, the palette is one that would make Murakami ecstatic (or maybe even make him blush). The potent, punchy, and happy color choices could make any form of blue go away in the person looking. Other notable pieces in the exhibition include Laura Watt’s hypnotic and sharp mandalas, Graeme Todd’s tiny and cartoonish landscapes, and Nathan Pankratz’s colorful and complicated mark-making. Rebecca Rutstein’s landscapes have lived happily on the walls of Bridgette Mayer for some time now, so it was only appropriate that her geometric and carefully crafted paintings made another appearance for this group show. All in all, Mayer curates a show that couldn’t be perceived as anything less than happy and easy to look at. Young and Fun proved to be a perfect title: both for the artists on display and to remind us all that at 13 years old, Bridgette Mayer Gallery remains young and fun. 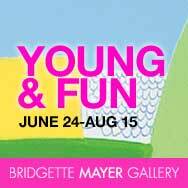 Young and Fun: Abstraction is on view at Bridgette Mayer through August 15, 2014.